Gov. 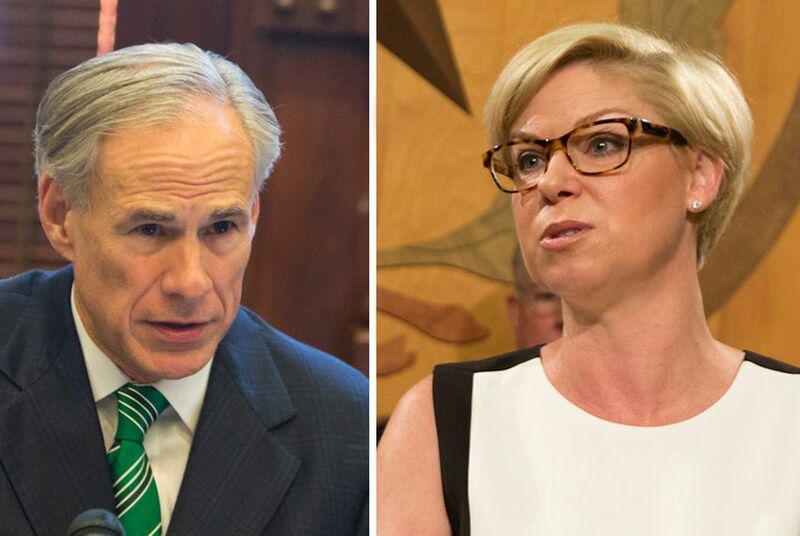 Greg Abbott accused state Rep. Sarah Davis of nearly thwarting the state's response to Hurricane Harvey at a private fundraiser Thursday evening for Davis' primary challenger, according to people with direct knowledge of the event. Gov. Greg Abbott accused Houston-area state Rep. Sarah Davis, a fellow Republican, of nearly thwarting the state's response to Hurricane Harvey at a private fundraiser Thursday evening for Davis' primary challenger, according to people with direct knowledge of the event. "Just a month before Hurricane Harvey hit Houston, Texas, she engineered an effort to convince the Texas House of Representatives to cut [$70 million] of the Texas Disaster Relief Fund," Abbott said at the fundraiser for Davis' opponent, Susanna Dokupil. "Now, fortunately, the Senate was wise enough not to go along with her. But, imagine where we would have been had ... Sarah Davis’ wisdom had prevailed." In an interview with The Texas Tribune on Friday, Davis called Abbott's remarks "the most disingenuous attack – that’s using the tragedy of Hurricane Harvey to score political points – that I have seen." While Abbott did not specify which legislation he was referring to, he appeared to be discussing a proposal from Davis during the summer special session that would have partially reversed a 2015 cut to disabled children’s therapy services. As introduced, Davis' House Bill 25 would have tapped the state's multibillion-dollar savings account, known as the Rainy Day Fund, to pay for the reversal, though it was later amended to dip into the state's Disaster Relief Fund, which the governor's office has since used to distribute more than $100 million for Harvey-related issues. Davis opposed the amendment, but that did not keep Abbott from blasting her for the final product Thursday. Abbott said the bill, which the House ultimately passed unanimously, was an example of how the incumbent "completely disregards her very own constituents and puts her own personal, petty politics ahead of the greater good for the people of the state of Texas." In the interview, Davis emphasized that she had been against the amendment, which was offered by Fort Worth Rep. Matt Krause, a member of the conservative House Freedom Caucus. She pointed to remarks she made on the floor at the time, expressing unease with taking so much out of the disaster fund — especially given her Houston-based district's vulnerability to natural disasters. "I couldn’t tell you that Harvey was coming," Davis said Friday, "but I knew there was a need for the Disaster Relief Fund." At the fundraiser, Abbott went on to describe the various parts of the state response to Harvey — the full deployment of the Texas National Guard and "helicopters that were plucking people out of the water" — and said the state "would have had none of that had Sarah Davis’ decision prevailed." "That is nothing more than petty politics above the greater good of her very own constituents, some of whom could have lost their life because of her decision," Abbott said. "It is time that the Republicans who live in [House District 134] get to vote in a primary for a real Republican who will represent real Republican interests, like Susanna Dokupil. And if you live in her district or not, Houstonians deserve to have a Texas House of Representatives member who is going to work with their governor and as opposed to working against the governor of the Lone Star State." Abbott's quote was provided to the Tribune by a person with direct knowledge of the fundraiser. A separate person, Elizabeth Graham, director of the anti-abortion group Texas Right to Life and a Dokupil supporter who attended the event, later told the Tribune that the governor "definitely drew attention to the fact that Sarah Davis ... was in favor of reducing the disaster fund, which in his view would've hampered Hurricane Harvey recovery efforts." Abbott's campaign declined to comment. Abbott's appearance at the Dokupil fundraiser — let alone his apparent criticism of Davis over HB 25 — underscores the lengths to which the governor is going to defeat a sitting lawmaker from his own party, a political rarity. And it shows how the contentious special session, when the House resisted a good chunk of Abbott's agenda, is shaping the political landscape as primary season heats up. The House's passage of HB 25 came at a particularly sensitive time for Abbott and the lower chamber. It was roughly halfway through the special session, and the House had not been making much progress on Abbott's 20-item agenda, which did not include any proposal to restore funding for children's therapy services. Days earlier, Davis led a news conference calling on Abbott to add ethics reform to the special session call, which Abbott's office denounced as "showboating." From the outset of the special session, Abbott had promised to keep tabs on lawmakers who embraced his agenda and those who did not — a point he made in backing Dokupil in November, his first endorsement against a sitting House Republican. His second came earlier this week, when he gave his support to Mayes Middleton, who is running against state Rep. Wayne Faircloth, R-Galveston.